Written by Jason Cormier. Jason is a freelance writer and accomplished shade-tree mechanic based in Montreal, Quebec, Canada. 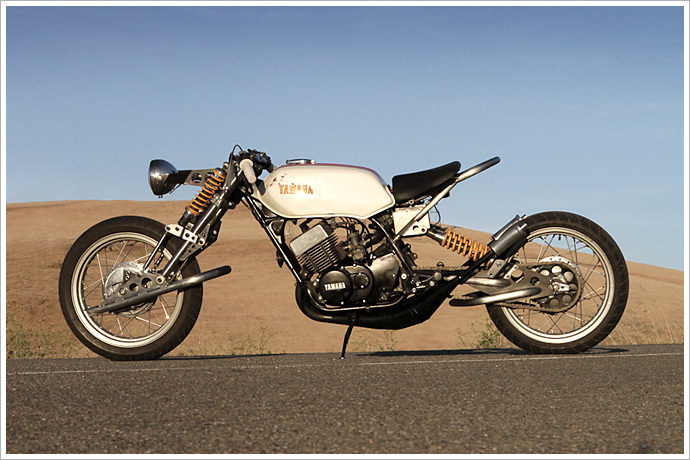 He is the editor of Odd-Bike.com, a selection of odd, exotic, unusual, and rare motorcycles from around the world. 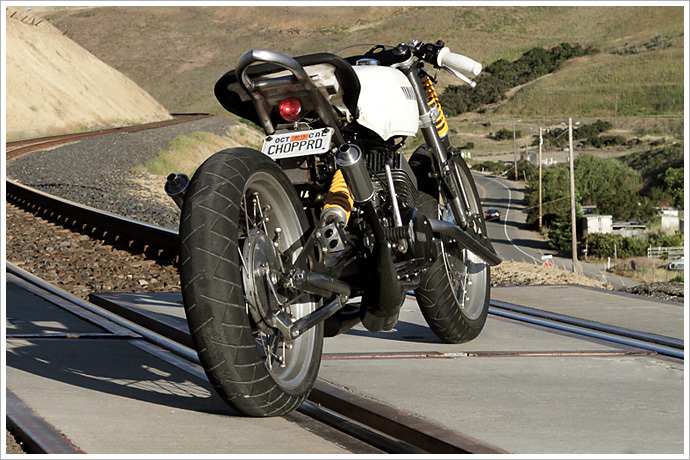 In a modest garage a few miles east of San Francisco, there is a man who builds motorcycles. This might not sound particularly exceptional, as there are men building bikes in many garages in many cities, and some of them are exceptional enough to get profiled on sites like this. 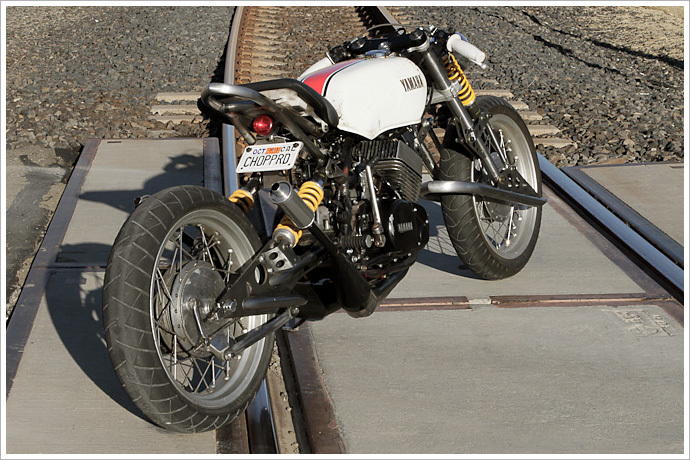 Julian Farnam is a different sort of builder though, and he has built a different sort of bike. He is a consummate tinkerer, a man who puts together unique machines of his own design in his spare time. It’s not his day job, but he is damn good at what he does – producing some of the most interesting and thoughtfully designed custom bikes you’ll come across anywhere. 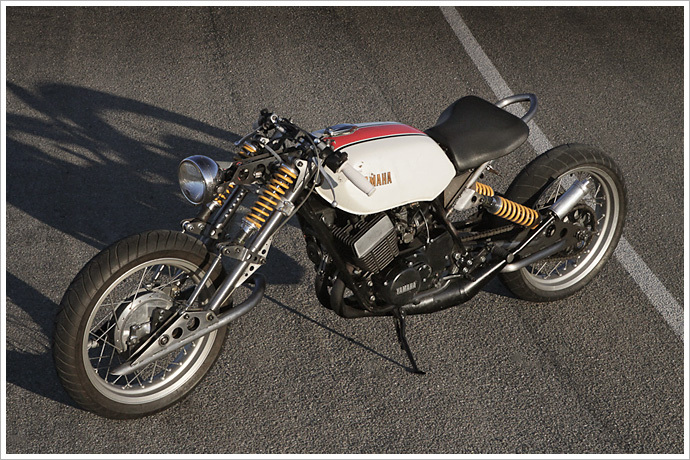 The bike we are featuring today is one of Julian’s odd creations, a raked and chopped Yamaha RD400 that applies one of Julian’s favourite concepts – alternative front suspensions. More remarkable is that the CHOPPRD, as Julian has christened it, was built in his spare time over a 30 day period for a total budget that could not exceed $1000 – that includes the donor bike and all the parts and modifications that go with it. 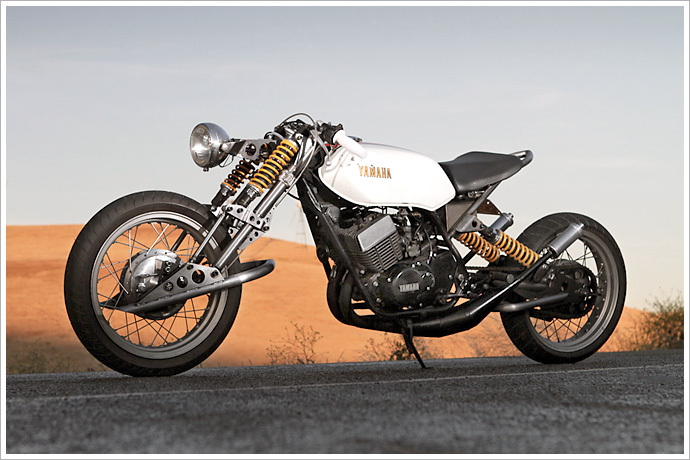 Julian has been building interesting customs since the early 90s, since he graduated from the prestigious Art Centre College of Design in Pasadena, California. One of his most spectacular builds was his FFE 350, a forkless-front-end chassis built around a Yamaha RZ350 engine. 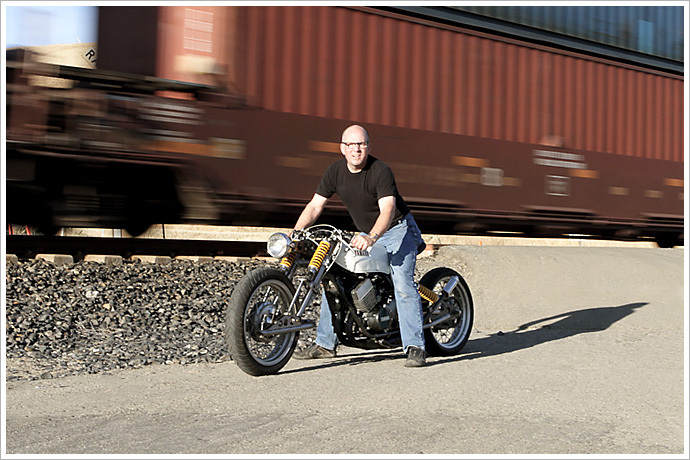 Today Julian works full time as a mechanical engineer for Dolby Laboratories in San Francisco and occasionally finds time to build frames for road racers & custom motorcycles. Where the FFE was a time consuming (nearly seven years) and highly-polished engineering project that could easily pass for a factory skunkworks prototype, the RD would be a much more rough and dirty build. In fact that’s the whole point. 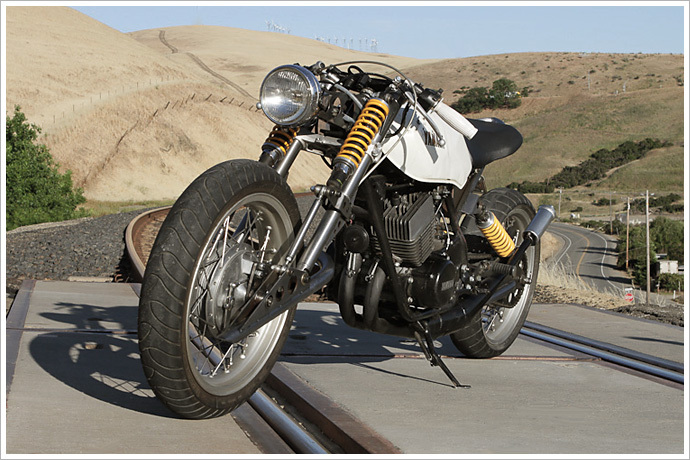 Julian built the CHOPPRD for the San Francisco Dirtbag Challenge, a self-described “low-rent chopper buildoff!” that sets a maximum budget of $1000 and a maximum build time of 30 days. Completed machines must be capable of riding a 100 mile loop on the Dirtbag judgment day without breaking, seizing, exploding, or catching fire: aside from those basic guidelines, everything goes. Julian was unable to participate in the 2011 build-off but vowed to return with something interesting for 2012. He spent months sketching and preparing for the build, filling notebooks with ideas and designs during his morning train commute and crafting models in CAD to ensure that everything would work once he set tools to metal. The rules of Dirtbag allow you to plan as much as you like in advance, and there are no set styles or themes, so Julian put lots of thought into developing a unique machine that he could build within the short window of time. The 30 day period is set by the Challenge organizers, so once the clock starts you have to get cracking – and with the complexity Julian envisioned for his contribution, he needed to have a clear idea on how to proceed to be able to meet the deadline – as this was a ‘spare time project’. The basic concept was to take a classic bike and build a heavily raked leading-link front end from scratch, with a reinforced and lengthened swingarm at the rear. Julian has long been a fan of two-strokes, having grown up with them and spent the better part of his life riding them, particularly Yamaha RDs and RZs. His first “real” bike was an RD250 he purchased when he turned 16. So it was only natural that Julian would gravitate towards an RD400 as the basis of his project. Unfortunately finding a running donor for under $1000 was practically impossible, so he had to resort to some creativity, several donor bikes, and the raiding his ample spares bin for parts. He brought the costs down by trading and selling whatever he could, and accepting donations from helpful parties. This is how he managed to snag an otherwise quite valuable “Daytona” fuel tank – rusted to hell inside and dented on the outside, but complete enough to be of use. In the end Julian was left with a complete running bike well within the Dirtbag budget. He even managed to snag a spare RD400 in “near running condition” for $200, which he has saved for a future project. If only the rest of us were so resourceful. The bike is thus a true Bitsa machine – the spoked wheels and drum brakes are from an R5 RD350, the frame and engine from a 1977 RD400, the exhausts are modified RZ350 expansion chambers with Toomey cans, the tank is off a 1979 RD400F Daytona Special, and bits and pieces are from various years of RD 250, 350 and 400 donors accumulated by Julian over years of RD ownership. Julian began by slicing up the frame, extending the steering head, and raking out the headstock to a very un-RD like 45 degrees. The subframe was chopped off and rebuilt with a bobbed seat support and forward shock mounts, topped off by a seat from a GSX-R. The resulting contraption is over eight feet long, and requires a stretched out riding position due to the use of re-use of the passenger pegs at the rear and clip-on bars at the front. The frame and suspension geometry is chopper, but the riding position is cafe racer, which gives the CHOPPRD a long-and-low appearance that looks remarkably coherent despite the mixing of worlds. The front fork was built out of steel tubing with a leading-link design that gives the CHOPPRD its characteristic look. A leading link fork places the suspension pivot point behind the front axle on a linkage that feeds the forces up to a pair of coil over shocks that provide the suspension action. It’s still a favourite design for dedicated sidecar hacks. The lack of geometry change as the wheel rises keeps your suspension setup consistent, as the wheel travels straight up and down, unlike a telescopic fork which can change the trail and wheelbase as the wheel moves up and back. Leading-link front ends also benefit from a lack of lateral flex, which is good when a sidecar rig is applying significant sideways load in corners. You also get natural anti-dive capabilities. As the pivot it aft of the front axle, the force of braking actually pushes the front up, not down like a telescopic fork. All of this academic, of course – Julian designed his front end to look badass, not win races. His design takes elements of the classic Earles fork (think 1950-60s BMWs) and a springer front end (ala 1970s American chopper or antique Harley). 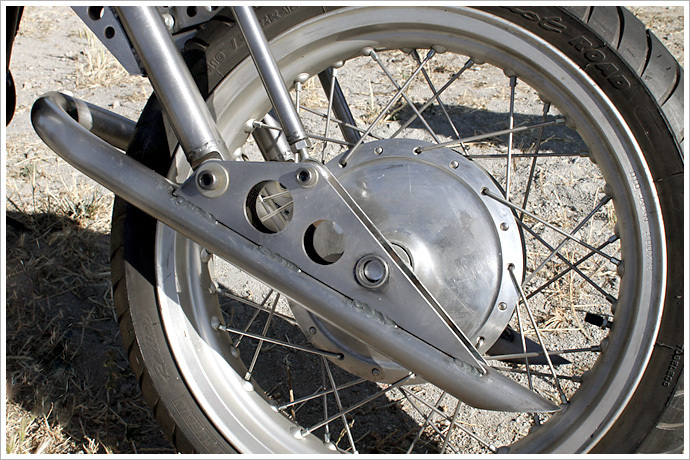 Julian’s design takes the large, reinforced swinging arm of the Earles’ front end and combines it with the high-mounted external springs and parallel pushrods of a springer fork, giving it a unique appearance that is neither fish nor foul but is characteristically Farnam. The upper fixed forks are clamped by a set of GSX-R 600 triples, while the springs are Mulholland rear shocks from the spares bin. Julian designed the front to accommodate a pair of Ohlins piggyback reservoir rear shocks off a Yamaha snowmobile, but didn’t fit them due to the budget constraints of the Dirtbag Challenge. In fact the long, insect-like headlamp bracket was built to accommodate the extra width of the Ohlins’ piggyback reservoirs. 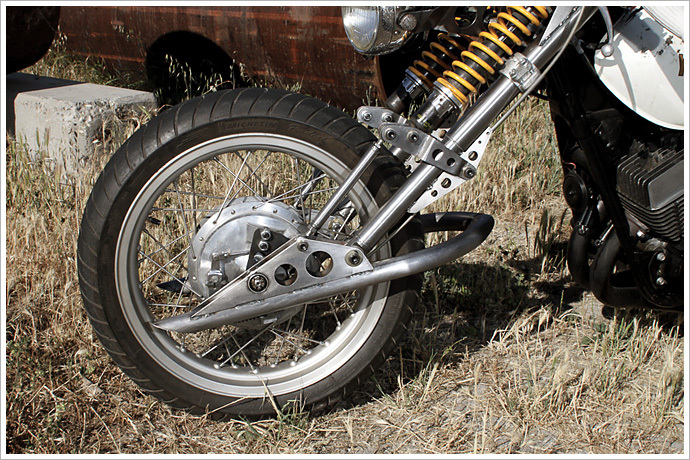 The rear swingarm is fabricated from steel tubing and a pair of massive 1/3-inch thick water-cut steel plates. Julian chopped the stock rear swingarm in half and extended it, adding an underslung tube brace. Everything is over-engineered and massively constructed without looking overweight – Julian likes to err on the side of caution when designing his components. Everything was cut, bent, welded and finished by Julian in his garage, the only exception being the water-cut plates on the swingarm. The rusty Daytona tank was carefully gutted and rebuilt, with some panel beating to straighten everything out without disturbing the nicely patina’d original paint. Julian maintained the rough elegance of the machine by leaving the steel components in their bare form, with a lightly brushed finish sealed by a coat of oil. Doesn’t rain or snow much in NorCal, apparently. Julian comments that riding the CHOPPRD is a challenge. The long wheelbase and stretched out riding position makes handling the machine a workout, and the raked leading-link front lacks trail which can make it unstable in slow manoeuvring. The parts-bin shocks are a bit soft, but he already has the Ohlins items on hand to fix that problem. He also notes that the anti-dive is actually too effective and the front bottoms, uh, up under hard braking, something he plans on rectifying in a future update. The resulting machine is beautifully crafted but just rough enough to fit in with the crowd at the Dirtbag Challenge, without compromising Julian’s characteristically impressive attention to detail. Every element of the CHOPPRD is carefully planned and executed while still remaining within the spirit, timeline and budget of the Dirtbag event. While Julian is modest about his fabricating skills, it’s clear that he is a skilled metalworker and is able to achieve remarkable results considering the constraints. His skills are not limited by such ephemeral concepts as money and time. 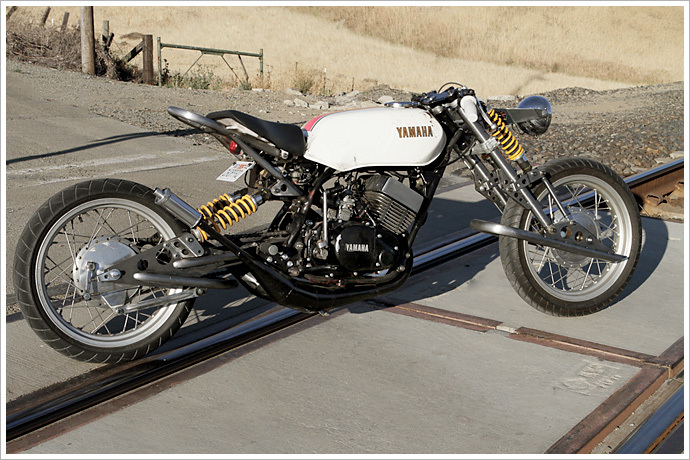 The CHOPPRD is one of his most impressive creations simply because he effectively slapped it together on a couple of weekends, and his effort was good enough to earn him a “Coolest Bike” award and an invite to exhibit the machine, alongside his FFE 350, at the 2013 The One Motorcycle Show in Portland, Oregon. Julian continues to tinker with various projects in his spare time, and contributes his frame-fabrication skills to other projects. We look forward to seeing his next highly polished contribution to the world of magnificently weird custom machines, especially his contributions to future Dirtbag Challenges.